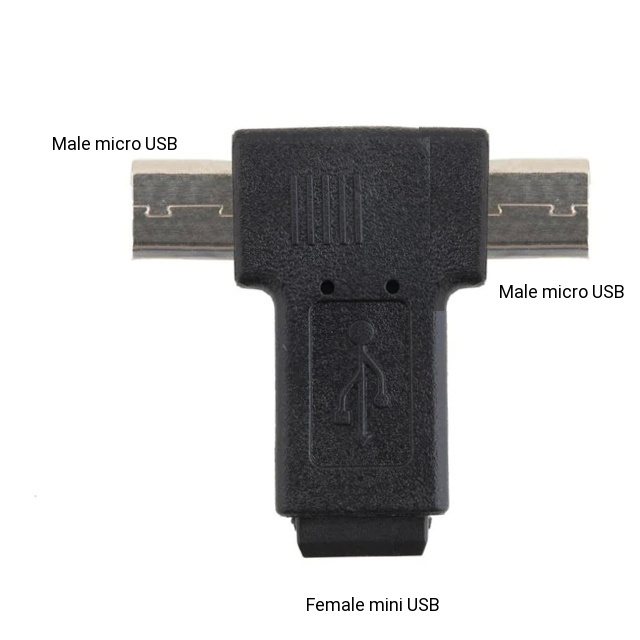 I am looking for a female mini USB to 2x male micro USB T-adapter as shown in the attached picture. If anyone know where I can find such a T-adapter, I certainly will appreciate that. > T-adapter, I certainly will appreciate that. If I were in a pinch I'd go with one of these and add an adapter from the micro female USB to standard type A female USB. Edited 1 time(s). Last edit at 08/30/2018 01:21PM by JoeyPogoPlugE02. > If I were in a pinch I'd go with one of these and add an adapter from the micro female USB to standard type A female USB. That is a micro USB splitter. I need a mini USB to micro USB T-adapter (or splitter).